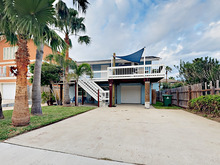 Plan a multi-family getaway to this 3BR/3BA South Padre Island home with room for ten people. The rental features two living rooms, two kitchens, and plenty of room to spread out! Your private outdoor space was made for entertaining. Relax in a hammock on the breezy front deck, fire up the grill for a family barbecue, come together in the expansive backyard. Dine at your pick of restaurants within walking distance. Or stroll to the beach just across Gulf Boulevard and settle in for an afternoon of surf and sun. An outdoor shower awaits your sandy feet when you get home. Come together in the living area, furnished with three leather sofas and a plush armchair. Catch your favorite shows on the 50” flat screen TV. The kitchen is equipped with a full suite of appliances, including a stainless steel French door fridge. Prepare a family recipe, and gather at the breakfast bar and dining room table ? each offering seating for four. Your private outdoor space was made for entertaining. Sip refreshing cocktails on the upper deck with picnic table, or fire up the gas grill and dine al fresco at the covered patio table. An outdoor shower is perfect for rinsing off after a day at the beach. At night, drift to sleep in the queen-size master bedroom with a 32” flat screen TV mounted on the wall. Unpack your bags in the mirrored closet, and refresh in the private en-suite bath with walk-in shower. The second bedroom sleeps three people with a full-size bed and twin daybed. Next door, the second bathroom is configured with a tub/shower combination. Find a third bedroom with queen bed in the lower-level apartment, where a second living area seats six on the futon (which unfolds to a full-size bed), couch, and armchair. Kick back to watch the 42” flat screen TV. Then, whip up a light meal in the kitchenette with fridge and stove/oven, and dine together at the bistro table for two. The third bathroom features a walk-in shower. Guest amenities at this vacation rental include complimentary Wi-Fi and driveway parking for up to four cars. This property is registered with the City of South Padre Island Permit No. 2017-167476. Your spacious vacation rental is situated just one block from the beach on sunny South Padre Island. Lounge on the sand with a good book in hand, and cool off with a dip in the Gulf of Mexico. Or treat yourself to an evening on the town, and dine out at a slew of local restaurants that line Padre Boulevard. For seafood, burgers, and craft beer, stop by Padre Island Brewing Company, a popular gastropub just a half mile from your door.